We are a friendly, informal walking and outdoor activity group based around the Bristol and Bath wider area. We aim to provide a full and varied programme of local walks, hill-walking, multi day hiking, scrambling and occasional other outdoor activities, such as cycling, mountain biking, climbing, caving, horse riding and canoeing. We have a mixed membership of all ages, abilities and backgrounds. New members, 18 years or over, are always welcome – to apply, see Contacts page or email our Membership Secretary. We publish a quarterly programme of events that are run by volunteer members. Our aim is to provide a day walk or cycle event every weekend of the year and some longer weekend events (camping or hostelling) in the warmer months when we travel further afield. Our day walks cover a wide area around Somerset, Wiltshire, South Gloucestershire, South Wales as well as local ones to Bristol and Bath. In the summer we also have 2-hour mid-week evening walks in the Bristol and Bath area, followed by a pub drink/meal. Our popular Annual Dinner weekend takes place in February when we hire a whole youth hostel. We periodically arrange weeks away in cottage accommodation. To get a flavour please look at our latest programme and read the FAQs below. Programme Review: 2017–2018 has been an excellent year for Egons with a wide range of local walks and other events which were all well supported. We had a successful Annual Dinner weekend in the Peak District at Youlgrave YHA in February. Other weekend trips included Kington & Offa’s Dyke, Snowdonia, Widecombe-in-the Moor on Dartmoor, Burley in New Forest, and Exmoor. We had perfect weather for a fantastic Scottish week in Torridon in May – climbing Munros as well as enjoying some coastal walks, cycling and even swimming in the loch! There have been recent trekking holidays to North Vietnam and Nepal. Walks are led, but walkers/climbers are responsible for their own safety. See our Health and Safety guidelines for details. We are affiliated to the British Mountaineering Council which represents climbers and walkers locally and nationally. Affiliation gives members free third party climbing/walking insurance and access to hut booking, BMC travel insurance, shop & YHA discounts, etc. How many members are there in Egons? 70-80 members so you will soon get to know people. We are very welcoming to new members. What is the age group? 40-70 with most in the middle, but we are keen to welcome any age. 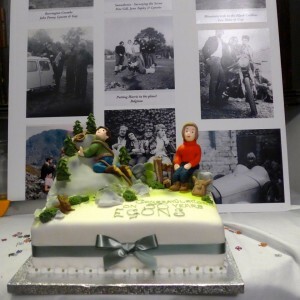 What makes EGONS different to other groups? It isn’t just a local walking group around Bath and Bristol. It offers a great variety of activities and locations. What does EGONS provide for my membership fee? EGONS is great value! Most of your membership cost is your BMC membership fee. This provides you personally with comprehensive third party insurance for a wide range of activities and other benefits, such as discounts at certain shops. Who organises the events? We have a programme co-ordinator each quarter. Members decide what they fancy doing and volunteer events. This leads to a really varied programme and lots of new ideas. How long are your walks? Our walks are typically 10-12 miles but can be longer in summer and shorter in winter. Are the walks restricted to Bristol and Bath? No , whilst we have plenty of local walks we cover a broad area including walks in Brecon Beacons, Forest of Dean, Quantocks, Mendips, Cotswolds. We also have many weekend trips further afield. Are your walks always day walks? Most walks are day walks although we do have some evening walks in the longer evenings of summer. How many people are on a typical walk? Numbers tend to be around 8-12 but can be more or less. Do I have to join before I go on a walk? No, you can come on a trial walk before you need to join. How do I get to the walks? Members are responsible for getting themselves to the walk start or to a meet point. Typically members lift share for the longer trips. What are the walks like, how fit do I need to be? Our walks tend to be hikes, i.e hill walks on mixed terrain rather than strolls so a reasonable level of fitness is required. How regularly do we walk? We aim to have an event every weekend. There are occasion mid-week and evening walks. Do I need to bring any equipment? You will need good walking boots, waterproofs and a rucksack. Can we take dogs? Yes, you may bring well behaved dogs but you will be responsible for the dog at all times. What are your rides like? They are mostly on quiet roads, tracks and paths suitable for hybrid bikes. How long are your rides? Typically 30-40 miles, but we have done shorter and longer ones. How fast are your rides? Typically 10-12 m.p.h. We are not competing with bike clubs. How often are your cycle rides? We aim to have one a month in the ‘nicer’ months of the year. Where do they start? Wherever the organiser decides to start the ride. What equipment will I need? A properly maintained bike, a helmet and some way to take your bike to the ride start point. How often are weekend trips? We have an annual dinner weekend in February and aim to have one weekend away per month from April to September. Where do you stay? We use youth hostels, mountain huts, cottages, B&B and camping. How much do they cost? That is very dependent on the event, but costs are always very reasonable. Where do you go? Two day weekends are within 3 hours drive from Bristol/Bath which gives us a range from mid-Wales to Cornwall. Long weekends to Snowdonia and the Lake District are also a regular. What holidays do you organise? Typically we organise a 1 week trip to Scotland in May. In recent years there have been many other ad-hoc holidays organised by members including cross country skiing, mixed activity weeks and even trips to Africa and the Far East. Do we have social events? Most socials are integral to weekends and holidays but we have the occasional social event too.